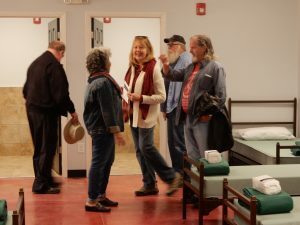 We are always delighted to have community groups visit Inasmuch or the Lodge to experience, first hand, this amazing ministry center. If you want to schedule a tour or coordinate a volunteer-service project, please call 433-2161 to coordinate your visit with a member of our team. Daily tours of the Lodge are schedule for 8:45am following breakfast. If you are a member of a group for seniors, sorority, fraternity, school, Sunday school classes, Military, business, community service, or other organization that holds meetings; we invite you to schedule a daytime meeting in our facility and we will conduct a presentation and tour of the Ministry Center or Lodge! Leadership Fayetteville brought a group of youths to volunteer and tour the ministry center.